Capoeira is a sport that we watch admiringly, since it's a form of combat that looks like dancing. It's been around for many years, but has only recently come to Turkey. Although most people prefer to simply watch, some choose Capoeira as their lifestyle. There are many theories about how Capoeira started. 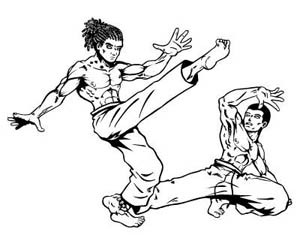 The most commonly accepted is that capoeira is a mixture of different cultures, different religions and different fighting styles that was developed by African slaves living in Brazil. The Physical Education and Sports Center has been offering a Capoeira course for three years now. The instructor, Monitor Dragao, stated to Bilkent News that Capoeira "is more than just a sport, it's an entire philosophy of life." Bilkent News also spoke with some of the students in the course and asked what they thought about Capoeira. Bora Çelikel said, "I've learned even more than I expected. We've made a lot of progress since the beginning of the course." İsmet Koç (Instructor at the Music Preparatory School), who said he had been taking the course for a month and a half, remarked, "It's a combination of many self-defense sports in one." Erce Özgecen (CTIS) summed it all up: "It's fun to dance and fight at the same time. I recommend this course to everyone!" Classes take place on Monday and Thursday from 7:30-9:30 p.m.